Yeah, you read that right. 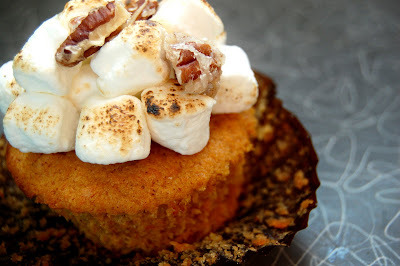 I put sweet potatoes in a cupcake! We are feeling festive now! 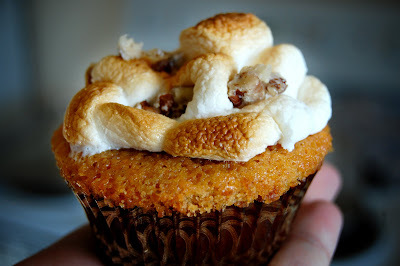 I have been very excited for these ever since it was posted as the November Martha Stewart Cupcake Club choice. I am one of "those people". You know, those that absolutely love "candied yams" or "sweet potatoes" on Thanksgiving. You are either a lover or a hater and I am definately a lover. Hence, just the sight of these made me giddy with excitement. Today's cupcake was chosen by Karen from Karen's Cookies, Cakes, & More. 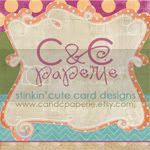 Check out her interpretation of today's cupcake and click here to check out other club member's blogs too. I started early this morning by baking 2 pounds of sweet potatoes in the oven. Once cooled they were peeled and mashed into this beautiful orange mush. It was a thick batter, but the cupcake turned out very very moist and has just the right amount of spice. These baked up with a flat surface and a light orange color. 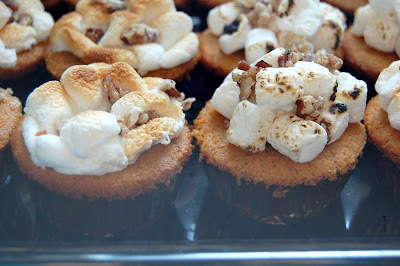 These are topped with toasted marshmallows and candied pecans. This is some serious yum here. Now the whole marshmallow fiasco turned out to be much more work than it was worth. They did end up looking gorgeous though. 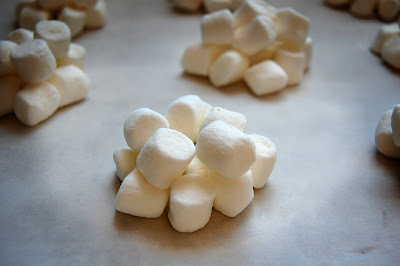 The directions instruct to place 24 mounds of mini marshmallows on a non stick surface. Then toast, then transfer to the cupcake, then sprinkle with the pecans. The mounds were simple (aren't they cute), the toasting was okay, the transfer was a bit of a problem, and the sprinkling of nuts was impossible. There you have it in a nutshell. Ha! I used my new little kitchen torch (thanks Dave and Em!) to toast 3/4 of them and I broiled about a fourth in the oven. They both have their advantages and disadvantages though I seemed to have more fires with the torch! 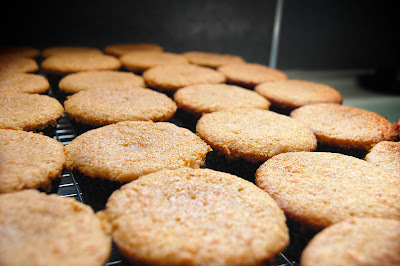 :) Transferring was a problem because my little mounds were falling apart on their way to the cupcake. I got that mostly worked out. The sprinkling of nuts was impossible because they just wouldn't stick to the mound and kept rolling right off. I somewhat got that worked out. I still wasn't satisfied by the end. All in all I really enjoyed these. Great flavors and such a fun little presentation with the toasted marshmallows. This is not a great picture but here is a comparison of my toasting methods. The one on the left was done in the oven under the broiler and the one on the right was done with my kitchen torch. You can find this recipe on page 243 of Martha Stewart's Cupcakes. I never got back with you about my MSC Creeper Cakes. I do have a few things to add. Sorry I was in such a rush last time. 2. You can find the One-Bowl Chocolate Cupcakes on page 152 and the Swiss Meringue Buttercream on page 304. 3. These turned out great! 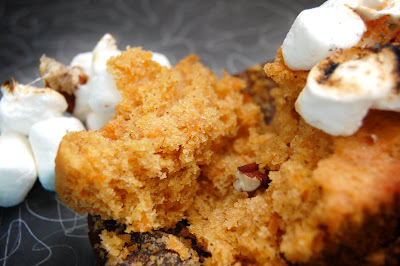 I had heard another blogger saying she didn't really like this recipe but I thought it was great and they were a big hit at our Halloween party. If you love to bake and havn't had the chance to pick this book up yet, you need too! I used to be so afraid of scratch cakes but am learning with each cupcake how wonderfully delicious they are. 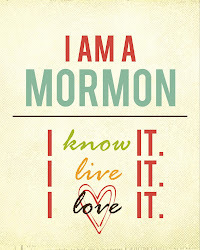 My beautiful sister received this book as a gift and you may be seeing her guest on this blog. Can't wait! She is my hero and is a fabulous cook and homemaker. Till next time! Wow, yours look AWESOME!!! Picture perfect; just like Martha's! Woo hoo! Thanks for baking along this month! You're a star! You did it again! great job with your baking. And it'd be great to see what your sister bakes up! Your cupcakes look awesome!! I had problems with the marshmallow toppingst oo! so very colourful and bright! Oh and congrats on the creep cakes!! super fun! 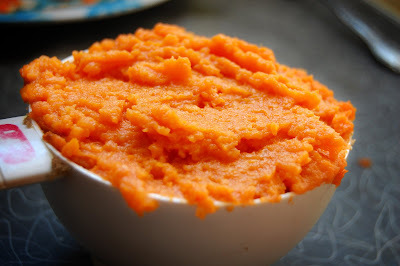 I love sweet potato side dishes. A lot. In fact, it's probably my favourite thing about a large holiday dinner. But I love a chocolate cupcake more than a sweet potato cupcake. Your cupcakes turned out great! It is interesting to see the comparison between the broiler and torch marshmallow toppings! Well these just look perfect! Except my potatoes weren't orange... maybe I picked up yams instead. Still good though! Love the topping - truly authentic! Nicely done! 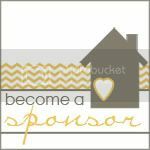 *** Can you enable the "NAME/URL" under "IDENTITY" so that I can leave a comment with my blog URL (above)? Thanks! Thanks for baking along with me this month! You did a great job and i love the photos. Appreciate the side-by-side comparison of the torch vs. broiler. I had a tough time stacking up the marshmallows without them rolling away. But these cupcakes were very fun to make. Great job! These cupcakes were so fun--tasty too. Thanks for your honest commentary. I know my limitations so I went with a browned butter frosting! *sniff* You are too sweet. :o) I love these. They are pretty. I'm not a big sweet potato fan, but J-dog is. Maybe I need to try them. Thanks again for the shout out. Love you lots, sis. I love all of the shots that you took of your cupcakes...they look great! Those look great - you had better luck with your kitchen torch than I did! My flame was too high. I think the oven method is the way to go. Nice job! Your cupcakes as always look gorgeous. Way to go for taking the time to do everything from scratch...definitely looks worth it.